Tom and I have been married for over 9 years and I never would have dreamed of the journey we would take together. When we met we both had high hopes for life and “moving up in the world.” One day all our dreams came true and we landed in a house in the neighborhood we always dreamed we’d be a part of. We had the house, we had the location and we slowly started to fall apart. We knew in order to save our marriage, family and finances we would need to downsize. 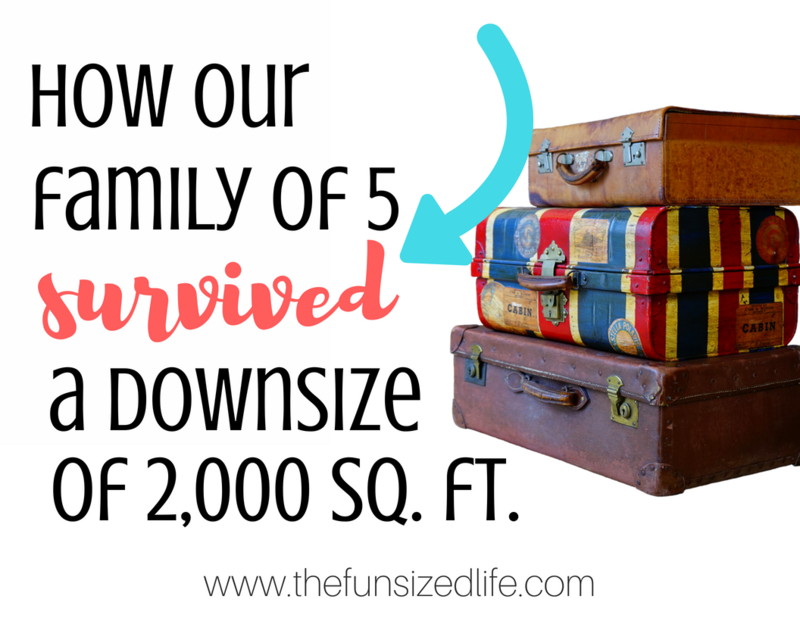 This is the story of how our family of 5 downsized survived a downsize of 2,000 square feet! *This post may contain affiliate links. For more information, see my disclosures. Living in such a high demand area houses were flying off the market and finding exactly what we wanted was tough. Gradually we would climb higher and higher up our price range until we found a house with more than we had ever imagined. Before we even signed the papers Tom looked at our monthly payment and wanted to back out. He couldn’t justify spending so much money on a house. We were both already burnt out from house hunting and were already living temporarily at his parent’s house. I just wanted a home again. Quickly I began to realize just how tough it can be to fill up so much space. There were 4 bathrooms, 4 bedrooms, 2 living rooms, 2 dining areas, 1 kitchen, 1 loft, 1 master suite with a walk in closet, 2 “storage” rooms and a partridge in a pear tree. But oh, those windows! Tom complained daily about the house. I would just roll my eyes. He is a complainer by nature. He complained when I painted the kitchen in our townhouse, he complained when we took a trip to Mexico, our car, our gym, the dog. What I came to realize was after a while he liked the color of the kitchen, he started planning our second all-inclusive vacation and he and the dog now had bonded. I had learned that he just takes a while to adjust. Some days he loved the house and he was happy to tell everyone where we lived. It was definitely a status thing. For both of us. There was an awesome feeling behind people “oooing” and “ahhhing” over how much space we had. As more people came to see the house, we were always giving tours and the tours felt like they went on forever. I started getting tired half way through. Each tour felt as if it was excessively long and felt almost snobby. Little did I know this was the start of our minimalist journey. A year went by, 2 years and Tom still didn’t adjust. He kept complaining. Our marriage suffered. We spent a year barely communicating. I honestly didn’t think we could hold on much longer. I started feeling suffocated by the stuff piling up in our storage. None of the decorating I wanted to do seemed important any more. I started reading self growth books and began realizing how much importance I had been placing on the material things in my life. So I started downsizing. Maintaining, cleaning, fixing up and renovating the house took up all of our free time it seemed. Weekends were spent with our whole family…fixing up the yard. Weeknights were spent picking up toys from 11 different rooms on 3 different levels. Don’t even get me started on the snow storms we moved into. Our previous townhouse had an association that took care of our driveway in the winter. We figured we could survive the first winter with just shovels…even though we had a 9 car driveway. Then the worst winter in Minnesota history happened (or at least it felt like it.) One day I checked the temperature and Antarctica was actually warmer. Tom and I started communicating. I listened to the concerns he had had for the last (almost) 3 years. As a wife, I cared more and respected his opinion. Financially we were doing ok, although we were still throwing money away on irrelevant things. But how much better could we do if we lived with less? Way less. How much more could we do with our lives. We started dreaming about where we could go instead of what we could have. I dreamed of less mess. Less rooms for my kids to trash….we wanted to be as minimalist as we could. I was burnt out on the accumulation photography required and I wanted Tom to have the flexibility to do things with his life that he truly wanted without the obligation of the mortgage of a big home. So, we listed our house. We listed it for 3 months. Took a break for Christmas, and then listed it again. In March 2016 we accepted an offer and prepared to move after 9 months on the market! There were so many things to get rid of. We had exactly 5 couches in our house. Yeah, definitely didn’t need all those. We cleared out props, chairs, couches, anything that was excess. We didn’t get rid of anything we would need because we weren’t going to buy any new furniture when we moved. The big mortgage reduction would be used to pay off debt. —We paid off 2 student loans, our car, credit card and are just finishing up our last loan debt. See the full story here. Our family found a house in our same city, like we had hoped. The finished square footage was exactly 2,000 square feet less than our “big house.” Yes, there was an unfinished basement and I wanted most of that space to stay available for the kids to ride their bikes in the winter. Yes, if you live in Minnesota an unfinished basement is a solid way to stay active year round. After 2 years of living in our 1,300 square foot house (and the unfinished basement) our whole family is officially on one level. The kids have toys in the basement, a few storage items and that’s it. There’s no doubt in my mind that if we lost that basement we would be just fine. Our marriage is as close to perfect as perfect can be. We realized our oldest daughter’s deep struggles with depression, anxiety and PTSD. –Had we not moved, I truly think she would have continued isolating herself in her basement bedroom and I don’t know where we would be today. I save that last one for last because it’s the one that weighs the heaviest on my heart. She misses our big house, or at least she did. Having her own room and bathroom in the basement was a teenage dream. I hope someday she’ll see that smaller quarters allows her dad and I to open our eyes and see her more. Downsizing saved our family and I believe possibly our daughter’s life. It just goes to show, bigger is not always better. Unless we’re talking about an ice cream sundae.